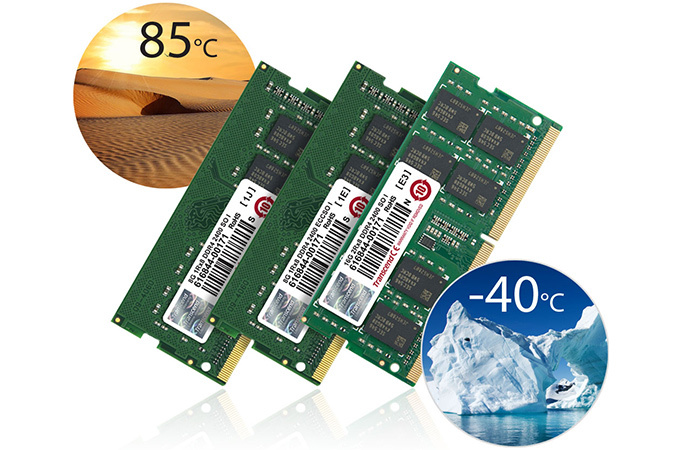 Transcend last week introduced a family of DDR4 SO-DIMMs that can operate in extreme temperature conditions. The modules are designed for industrial computers, special-purpose PCs, POS, ATM and other systems that work in rough environments for 24/7. Subsequently, the SO-DIMMs can be used safely in SFF PCs without decent cooling for prolonged amounts of time. Transcend’s new industrial grade memory modules use special PCBs that have industrial-grade capacitors, 30μm gold-plated contacts and are designed to withstand shock, electromagnetic disturbance and extreme temperatures from –40°C to +85°C. In theory, it means that the SO-DIMMs are rated to operate in Antarctica or in the Lut Desert in Iran. In the real world, Transcend’s new SO-DIMMs will be used inside space-constrained industrial PCs, military systems, embedded systems and others that work 24/7 in rough conditions and/or without decent cooling. The new industrial-grade modules from Transcend are based on Samsung’s 8 Gb B-die DDR4 chips (marked as K4A8G08) that were hand-picked and tested to run in extreme conditions. The SO-DIMMs come in 8 GB and 16 GB configurations and are rated to operate at 2400 MT/s at 1.2V, which means that they are fully compatible with the industrial-grade, embedded and low-power CPUs that support DDR4 at JEDEC speeds. The new modules carry Transcend’s lifetime warranty. Pricing of Transcend’s new industrial-grade DDR4 modules is unknown as for industrial customers it typically depends on actual sales volumes. We would expect the modules will be more expensive than typical SO-DIMMs because they use special PCBs with 30μin gold plating, components with extended temperature ranges as well as cherry-picked memory ICs.